If you want the absolute best sound quality from your digital music files, they need to be bit-perfect rips from CDs stored in a lossless compression format. I recommend using dBpoweramp Music Converter (dBmc) to do this. This page describes how to configure dBmc (version 12 or 13) for the most accurate bit-for-bit perfect backup of an Audio CD (compact disc). 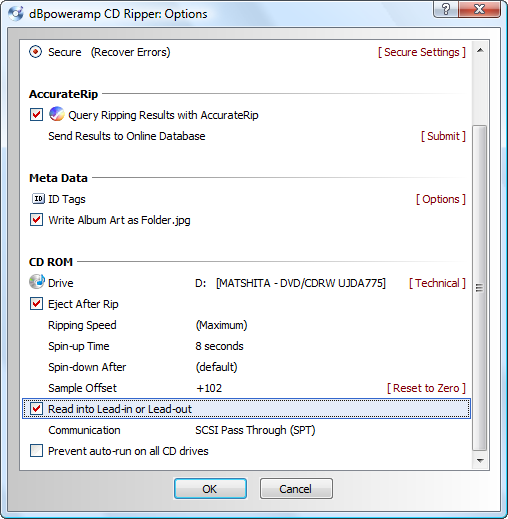 Install dBpoweramp CD Ripper and Music Converter. You will need to use either The PowerPack Version ($24; 3-week free trial) or the Reference version ($36; 3-week free trail.) I use the PowerPack version. Note: It is possible to achieve the same results using the free software Exact Audio Copy (see this post for configuration details), but I find that dBpoweramp is easier to configure, is easier to use, has a fantastic file format conversion utility, and it has access to 4 total metadata providers for accurate tag creation. If saving $24 is more important than ease-of-use and time spent retagging files, EAC may be for you. Otherwise, dBmc is the way to go. 1. After installing dBpoweramp Music Converter, run dbPoweramp Configuration. 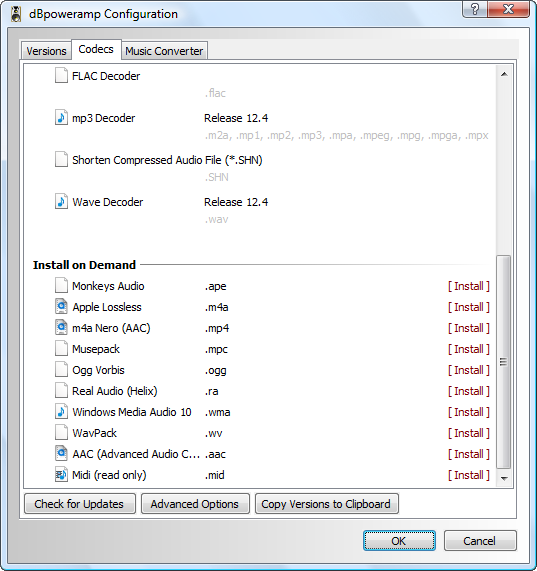 If FLAC (or equivalent lossless codec) isn’t installed, install if from this window. 2. 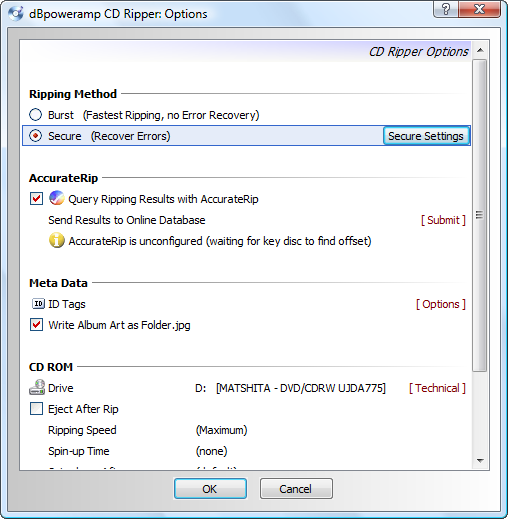 Open “dBpoweramp CD Ripper” and click the Options button. 3. 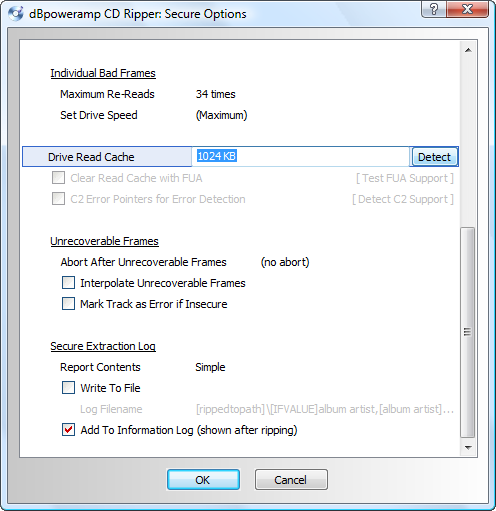 Check the boxes for both Secure Ripping Method and AccurateRip. Then click “Secure Settings” button under Ripping Method. 4. 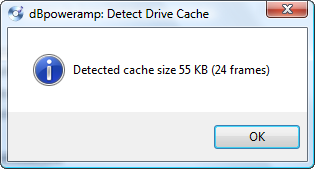 Click Detect after the following window appears. 5. CD Optical Drive caching is being detected. 6. CD Optical Drive caching detected and configured. Click OK to continue and OK again to close the Settings/Options windows. 7. Click OK to save Options and return to dBpoweramp CD Ripper. 8. If it appears, do not check the box for Read Lead-in and Lead-Out unless you have issues with extracting the beginning of the first track of end of the last track. 9. Now instert a popular CD from your collection. You need to find one that is in the AccurateRip database, and you may have to try several. 10. When you insert a CD that is in the AccurateRip database, the following box will automatically display and AccurateRip will auto-configure. 11. Select the output file format as FLAC; compression level 8 will give smaller files but will take longer to encode on slower CPUs. 13. Select the DSP tab and then add ReplayGain as the DSP effect. Select both Track and Album gain. 14. ReplayGain should now be shown as a DSP effect. 16. This how compilation CDs will be named using my settings. 17. This is how multi-CD sets will be named using my settings. 18. Done! You are now ready for bit-perfect, lossless CD ripping. If all tracks on a CD give a confidence of 12, except 1 which has a confidence of 0, then there is probably a problem with that zero confidence track. If all tracks are 0, either the disc is heavily damaged or the CD isn’t in the AccurateRip database. Thanks for posting the dBpoweramp config setting How-to. One additional question regarding Flac compression. The default is dBpoweramp Setting is level 5. You suggested using the Setting level 8 although taking a longer time to encode. Can you tell if there is any more over head to decode the compressed file on playback given you must not first read the file from disk but secondly decode it? Also, What should I be looking for relative to confidence in the Rip? The AccurateRip confidence range for the tracks I rip range from 5 to 9 for a single pass. Bob, there is no difference on the decode overhead for higher compression levels. The requirements for FLAC decode hardware are very minimal; encoding is the only CPU-intensive step. For Accurate Rip confidence, anything great that 1 is good and the higher the better. The application doesn’t do a good job of explaining what that number means; it’s the number of other people that extracted the exact rip as you did. So if all tracks on a CD give a confidence of 10, except 1 which has a confidence of 0, then there is probably a problem with that zero confidence track. If all tracks are 0, either the disc is heavily damaged or the CD isn’t in the AccurateRip database. I have a CD that has one track with a 2 and the rest are 200…brand new cd. Is this defective? I would like to thank you first for all your help and patience in the past with getting me up and running with dbpoweramp. I now have all my CD’s ripped to Flac and am very pleased wih sound quality. I would like to ask your expert advice today on another matter.I recently purchased a Ford truck with Ford sync and a USB input.I would like to burn music to a USB thunbdrive to use in vehicle unfortunatly the truck does not support Flac files only MP3,Wav,ACC and WMA.I would greatly appreciate your input on which one of these formats will give me the highest quality sound.I have a 16gb thumbdrive but will purchase a larger one if fie size is an issue. Sound quality is most important. 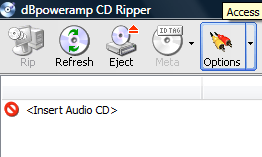 I will be making copies of my Flac files to convert to whatever would be best format and using dbpoweramp to do this. I am reaching out to you today to ask you for some help with a question I have about music file formats.I recently purchased a Ford truck that has Ford sync as well as a USB input. I would like to download albums onto a USB thumdrive and be able to listen in my truck.Unfortunately the system does not support Flac files only MP3,Wav,ACC and WMA. I would appreciate any advice you could give me regarding which of these formats would offer me the best sound quality. I have a 16gb thumdrive but will purchase a larger one if file size is an issue. Sound quality is the most important. I will be making copies of my Flac files and converting them to whatever you suggest using dBpoweramp. Keith, glad you found the info useful. At lower bitrates (128 kbps or less), there can be some significant differences between the compressed formats. However, if you encode them at higher bit rates (256 kbps or higher), you won’t be able to tell the differences between any of the formats; they all sound great. You listed WAV as one of the options; this is also a lossless format. The problem with WAV is that 1) the files are big and 2) there is no universal tagging format, but it may work for you. There is also WMA Lossless format that may play back on your Sync system. Since SYNC is a Microsoft system, WMA and WMA Lossless are a Microsoft file formats, there is a chance they will work. If you “just want it to work” without messing with it too much, I’d recommend MP3 encoded at 320 kbps. This should play on about any system out there and will offer very good sound quality. IME if Keith has a decent, multi-speaker sound system in his truck, there will be some payoff of going with WMA lossless instead of 320kbps. Even with modest road noise the increased dynamic range will be obvious vs MP3. This is even more noticeable when you compare a CD vs MP3 on a decent car system. But if his system is a basic stock head unit and two speakers, it won’t nearly bring the same impact. Just a few follow up questions 1. 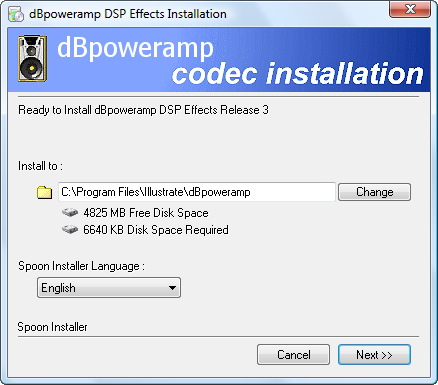 If I decide to go with the MP3 format using dBpoweramp to convert to 320kps the target in the encoder settings would be free format so I can get to 320kps as opposed to VBR or ABR or CBR? and under advanced would you force stereo as opposed to auto since I would be using higher bit rate or is there no need? 2.It appears that Sync does support WMA lossless so would that be the better choice? It appears that dBpoweramp will let me add this file codec as add on and allow me to convert to WMA lossless Finally any settings in WMA Lossless that you recommend. Sorry for all the questions and questions and questions and thank you again for the knowledge and help.Will keep it to a minimum from here on. WMA Lossless would give the best quality (identical to FLAC), but not sure you could hear the difference and it would take more drive space. It will be a trade-off between quality and # of songs on a flash drive. There aren’t many settings to mess with for WMA Lossless, so just us the default. Thanks again for your help. It’s great to have you out there to clear up the confusion. This is a great site and your a great person to give of your time. Hey Keith. I am weighing in on this thread waaaaay late. I have an 2012 F-150 with Sync with voice and nav installed. Sound system is an OEM designed by Sony. I recently discovered a 2nd USB (USB – Mini A) in the back of my unit by reading forum posts and taking off the tray to the center speaker to reveal behind the dash. So I went and bought a USB 3.0 Toshiba External Hard Drive with an adaptor and installed it. The hard drive is the size of a pack of Canadian Cigarettes. I transcode from FLAC to WMA Lossless and listen to that codec exclusively. It provides a fuller richer sounder especially in the low to mids. With the expanded capacity of the hard drive over the thumb drive, I have more than enough room to hold all my music. Good to hear you were able to expand your listening options! This Page used to have way more info that no longer shows up. What I really need is the naming string that used to be on this Page. I had to reinstall windows and i need that naming string before ripping anymore cds. Thanks Ryan. I had to export, purge, and repopulate the server database and it looks like the gallery photos and text didn’t survive the process. Give me some time to search the old database and find the missing data. Mo, it used to be that Plextor drives were the reference standard. But to be honest, that was a long time ago and I haven’t noticed issues with any of the drives I’ve used in the past 5+ years. Blu-ray readers are pretty cheap now and I haven’t had issues used them either. I have a 2 CD set that has the first 4 tracks of the Beethoven ‘Missa Solemnis’ on disc 1; The fifth track is at the beginning of disc 2, followed by the 5 tracks of Mozart’s ‘Mass’. How do I get the fifth track of the Beethoven into the folder containing the Beethoven where it belongs? I can get the Mozart in a folder by itself by just selecting out the Beethoven track. I’m glad you found it useful! I’m contemplating my third attempt at ripping my CD collection. I’m getting old and have way too many discs, so I want this third time to be the proverbial charm. The information for dBpoweramp claims to use multiple cores on processors that have them. Having seen fairly startling increases in throughput from other (non-audio) applications that have added support for multi-cores, I’m curious as to how long it takes dBpoweramp to rip CDs to FLAC.Have you timed the process? If so, is it possible to estimate ripping time from the total time of a disc? And can you compare the time to other ripping applications? Mark, there are 2 phases to ripping a CD: reading it from the optical drive, and then compressing the audio to a file. Modern CPUs are so fast that they can easily compress to FLAC (or any other format) much faster than the optical drive can read it. So the pacing item will be the optical drive speed. And if there are scratches or errors on the disc, it will slow the read speed substantially, and that will be the pacing item. If everything goes perfectly, you can read a disc i less than 6 to 10 minutes. To speed up the process, add optical drives. The desktop Plextor drives have been good for me in the past, but most of the brands are probably just as good. David, burning at a faster speed can definitely result in read errors on some players. At up to about 4x, the burned pits are accurate. Faster than that, and the burned pit structure starts to deviate from the standard. It’s generally close enough that it doesn’t cause an issue, but not always. Burn speed is determined by the burner software more than the drive itself. To burn at slower speeds, just change the software setting. For ripping from a disc, as long as you have error correction enabled and/or use accurate rip, read speed isn’t much of an issue. The software will read and re-read as necessary when errors are detected. I just leave it at maximum speed and let the software adjust as necessary. Very informative site! Thank you very much for posting this great informative site. My question is… If my intent is to be able to convert FLAC to either MP3 or M4A, should I rip with FLAC with uncompressed, Level 8, etc… or should I rip to WAV uncompressed? Using the level 8 settings saves the most space, and isn’t much of a headache since you probably won’t be encoding more than once. YMMV. FWIW, the encoding process takes longer on 8. Forgive me upfront if I missed it earlier because I am banging my head because I am an audiophile and quality is the utmost important item over size with me personally. That said, I am trying to rip a CD from my internal optical drive and I am using DBPA reference 14. I would like to accurately rip a CD to FLAC in it’s highest quality. Do I just add the FLAC add-in and configure FLAC setting to the number 0 and that’s it and rip away? Or am I missing some other elements to add/configure to get the highest sound quality? Thanks in advance Carlton !! Yes, it’s pretty much that simple. Except there is no sound quality difference between FLAC 0 and 8. Lossless is lossless. It’s just with 8, it works the CPU much harder trying to optimize and minimize the file size as much as possible. That last sentence has me wondering if FLAC 8 causes the CPU to work as much harder to decode the file as it does to encode it. P.S. I’m finally going to get going on the Great CD Re-rip Project I alluded to 26 months ago (!). I have the time now that I’m retired. The CPU decode load is constant regardless of the encode compression setting. The CPU cycles are spent trying to encode to the smallest possible file size that meets the FLAC format, but the decode is the same regardless. That’s good to know. Thanks! A PC can undoubtedly do this with no issues. Thank you coach Carlton, I just bought it the app for my macbook, yet I just wanted to really appreciate how rich of details your article. I have to admit, I didn’t even realize that a Mac version was available! I’ve been using X Lossless Decoder (XLD), and it’s adequate, but will definitely switch to dBpoweramp now that it’s available. One thing I’ve noticed here is you haven’t mentioned anything about the Ultra Secure Ripping option under the Secure Ripping menu. Do you have it enabled? To what setting? And if not, why not? You can use Ultra Secure Ripping if you are having issues with 0 matching results returned from AccurateRip. Otherwise, it’s not necessary. I remember it being a little slower, but that may have changed. Although not lossless do you have a “how to” tutorial for installing MP3 Encoder Lame 3.99.5? I do not see how you install with a Tarball extension and have never seen an exe for it. Maybe you can help. Sorry, I’m not sure about the LAME settings or configuration. Will you consider doing a configuration tutorial for the Mac version? Or is it too similar to the Windows version? Allan, I haven’t used the Mac version yet. I don’t purchase that many CD anymore and I’m not sure I’ll have a chance to create a Mac version tutorial. Hopefully the setting are similar enough that they will work. I have a problem with a disc that had a few milliseconds of the beginning of one track appended to the silence at the end of the previous track, with that data missing from the track it belongs to. 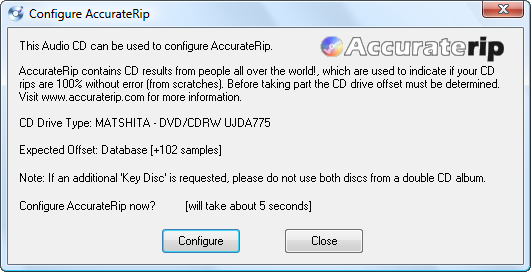 The rips for both were secure with the same AccurateRip scores as the other tracks on the disc, so it looks like the CD track info was configured incorrectly. I thought to use Rip as 1 to fix the problem, but that seems too fussy. It was easier (read: “faster”) for me to load the files into Sound Forge and do a copy-and-paste between the two. I discern no difference in the sound of the previously split song, so I’m happy. Is there something else I might have done in dBpoweramp to fix the problem? What you did is really the best option. You have to edit the files if the disc is incorrectly authored. dBpoweramp isn’t designed to fix issues like this. One question that I have, in particular, is weather it is a real advantage to have the track number at the beginning. Is it going to work well with most music collection software, such as Fidelia or Audirvania? Did you ever experience issues with track order or so? And are double albums recognised automatically? Thanks a lot, man. Great tutorial. Although by the time I read it, the version number and look and feel of the prgram has changed slightly, the core elements and settings are the same. I’ve used EAC for ripping CD’s for as long as I can remember. Now I think I was kidding myself all that time. DBpoweramp and Perfect Tunes, I use in combination now… just one word. Perfection ! Worth every penny! Extraordinary comfort and quality. I have about 350 AIFF files I want to convert to FLAC in order to minimize file sizes. foobar2000 has no support for transferring AIFF metadata, so I’ll be using Music Converter. I tested it on a couple of files and didn’t seem to have any problems, but I wonder if I might need to tweak the configuration. Have you used Music Converter and, if so, do you have any advice? I use and highly recommend dBpoweramp Music Converter. That’s not really anything you need to do to the settings; it will work without issue. I set compression level to 7 to reduce file size as much as possible, but there isn’t much difference in file size. If you want to maintain folder structure, set it to save the converted file in the same folder as the original, then delete the original. The ReplayGain offset is stored in the metadata, and does not change the extracted bitstream. The ReplyGain metadata basically tells the playback device to offset the reference playback volume by a specific amount. In other words, it slightly adjusts the volume setting of your player without you having to do it manually. But it’s the same as manually adjusting volume up or down, with no impact on the source.